This wasn't really a press conference, but more like the beginning of a media campaign. 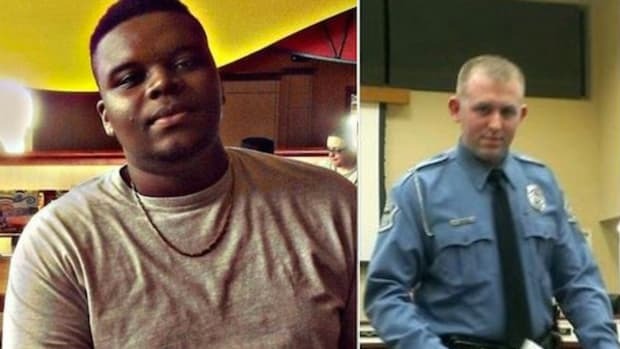 At a much-anticipated press conference Friday morning, Ferguson Police Chief Thomas Jackson rolled out his department&apos;s latest media strategy, pairing his announcement of six-year veteran Darren Wilson as the shooter of Mike Brown with information on a "strong-arm robbery" that occurred just before Wilson shot and killed the unarmed teenager. Jackson haltingly delivered the information in a carefully-worded statement to reporters Friday morning, handing out a packet to media that contained information on a "strong-arm robbery" of a convenience store, including still frames from video surveillance. Without directly accusing Mike Brown of being the suspect in that robbery, Jackson recited a timeline of dispatch calls. He capped off the minutes-long presser by naming the officer involved, but still released no new details about the killing of Mike Brown, such as the number of shots that were fired. 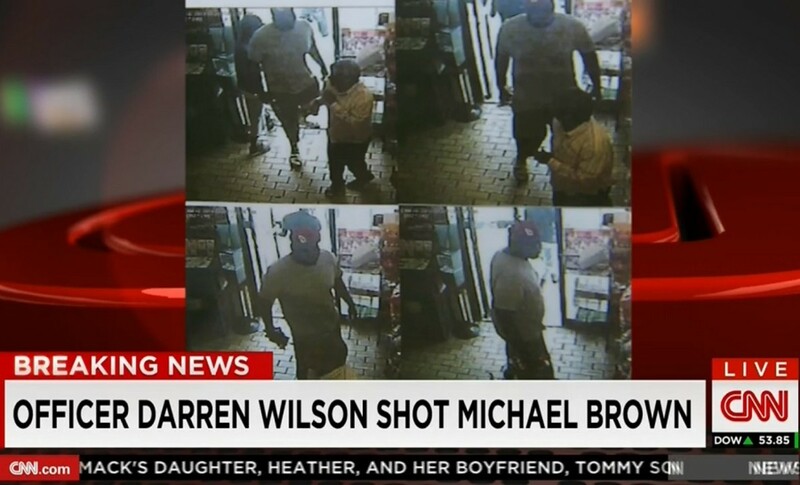 "The officer that was involved in the shooting of Michael Brown was Darren Wilson," Jackson said. "He&apos;s been a police officer for six years, has had no disciplinary action taken against him." "I won&apos;t be taking any questions today... right now, not today, I won&apos;t be taking any questions here. I want to give this information to you, let everybody digest it, and then later on sometime after noon, we can get together again, and then I&apos;ll take questions." "I guess the problem I have -- the police are just allowing the media to determine who this person is in the surveillance tape, and I&apos;m not sure that that&apos;s the right road." Many have been quick to point out that even if Mike Brown stole cigars, that crime does not carry an extrajudicial death sentence, but what this campaign has done is to completely shift the thread of this story. 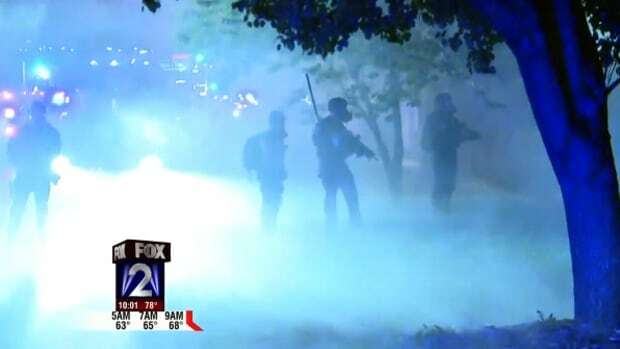 The Ferguson police have succeeded in blasting out this frightening image, gotten the media to connect the dots, all without answering any questions at all about what the police officer did. This afternoon&apos;s press conference will show how well that strategy worked. 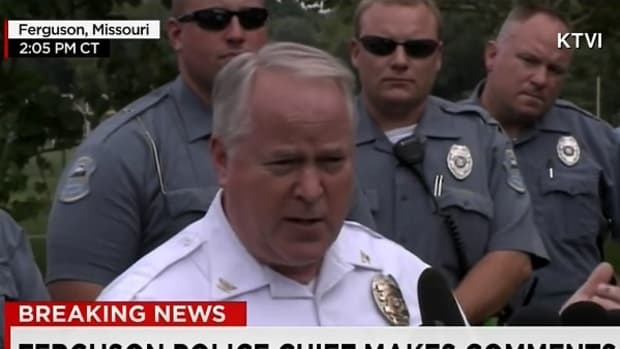 Update: Governor Jay Nixon and Captain Ron Johnson of the Missouri Highway Patrol held a much lengthier, more open press conference this morning, with Captain Johnson making a point to take questions from residents, as well as the media. Unfortunately, the guys who know how to hold a press conference don&apos;t have the answers to the questions that Ferguson PD has left unanswered. One remarkable moment came at the end of the presser, when a woman in the crowd absolutely went off on the media ad the police, and asked an excellent question: what happens when the media and Captain Ron Johnson are gone? 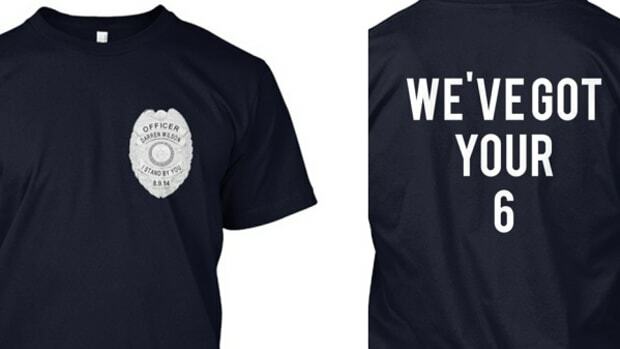 The people of Ferguson will be left with the same police force they had on Wednesday. "Michael Brown’s family is beyond outraged at the devious way the police chief has chosen to disseminate piece mil information in a manner intended to assassinate the character of their son, following such a brutal assassination of his person in broad daylight. 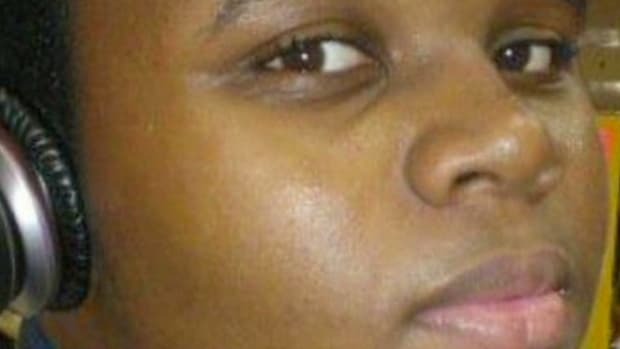 The police strategy of attempting to blame the victim will not divert our attention, from being focused on the autopsy, ballistics report and the trajectory of the bullets that caused Michael’s death and will demonstrate to the world this brutal execution of an unarmed teenager." Update: 3:23 pm Ferguson Police chief Thomas Jackson haled another press conference, at which he esentially spent ten minutes explaining that he absolutely had to release the surveillance video because te press asked for it, but couldn&apos;t rlease any other information because everything besides the video that helps his officer is "owned" by the county police. 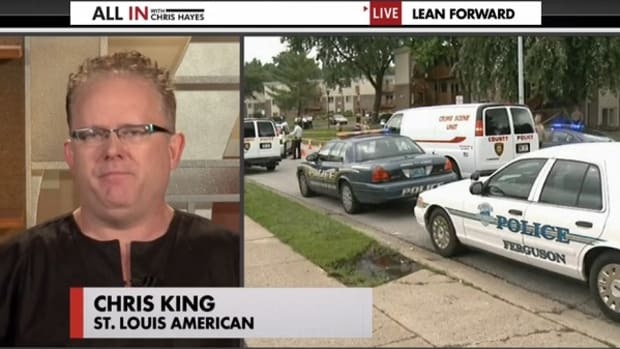 He also confirmed that the stop of Michael Brown was not related to the alleged "strong-arm robbery." Stunningly, no one bothered to ask how many times Mike Brown was shot, or how many shots were fired. 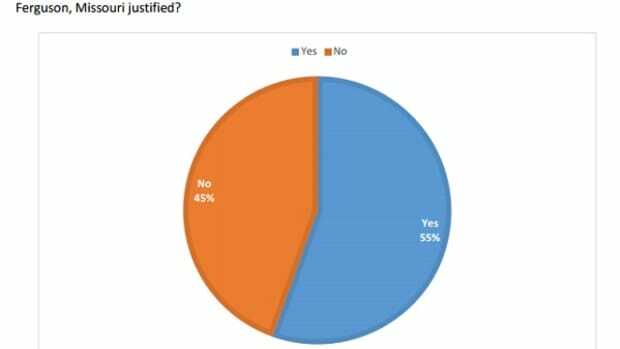 How Many White People In St. Louis County Think Mike Brown Deserved To Die? 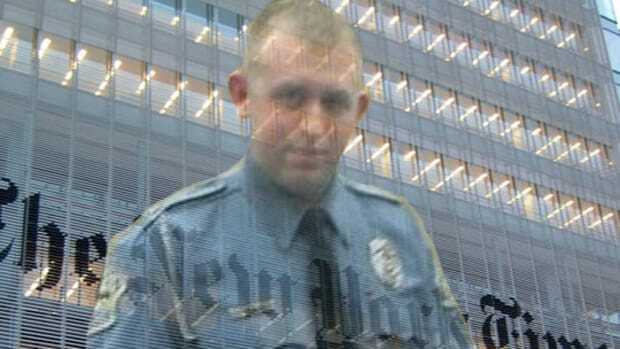 Why Did The New York Times Only Tell Part Of Darren Wilson's Story?